Ultrasound in Medicine is a broad-ranging study of medical ultrasound, including ultrasound propagation, interaction with tissue, and innovations in the application of ultrasound in medicine. The book focuses specifically on the science and technology-the underlying physics and engineering. It examines the most closely related aspects of these basic sciences in clinical application and reviews the success of technological innovations in improving medical diagnosis and treatment. The book bridges the gap between tutorial texts widely available for ultrasound and medical training and theoretical works on acoustics. "… provides a very useful overview of the subject focusing specifically on the physics and technological challenges … the standard of presentation … is high … and the experience … the authors have in teaching shows itself in the clarity with which the subjects are dealt … a valuable source of information for anyone working in the field of the physics or technology of ultrasound and will be frequently reached for on my shelf." 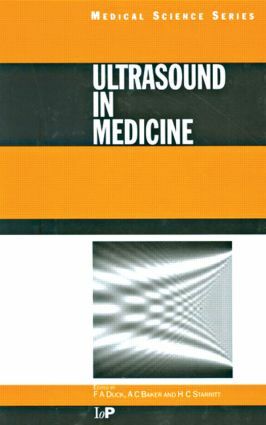 "This magnificent book is recommended to all those who wish an intermediate/advanced text on the physics and technology of medical ultrasound."